We currently have set up studio in the Rocks where we are working and also presenting 1000s of People Make Places Match Box Portraits we have collected from locals living across the globe including from our newest collaborators in Venice, London, Edinburgh, Berlin and Dubai. 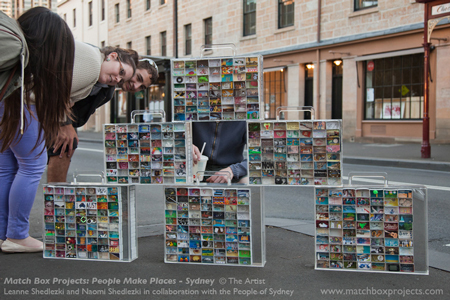 We will also be handing out and collecting matchboxes from Sydneysiders who would like to contribute to our portrait of Sydney. look on this blog daily to see any added times. This entry was posted on Tuesday, July 1st, 2014 at 8:50 am	and is filed under Our Blog. You can follow any responses to this entry through the RSS 2.0 feed. You can leave a response, or trackback from your own site.